To get the right percentage of salt to cure your bacon you need 3% salt (supracure) to the weight of your meat. Then when you have added your various herbs, sugar and flavourings, you need to allow 3 days of cure for every 500g weight of meat. This piece cured for 12 days as it was 2kg. Find a large plastic lidded container that your piece of meat will fit in with a bit of room. In a pestle and mortar, measure out the juniper berries, peppercorns and fennel seeds and break them up. In a separate small bowl place the salt, sugar and other ingredients followed by the crushed spices. Give it a good mix. 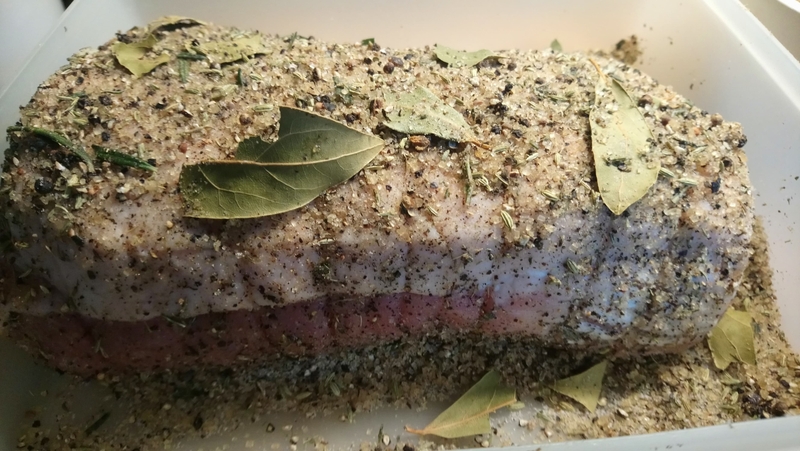 Place the piece of meat into the container and then smother this rub all over the piece of meat, giving it a good massage. Put the lid on and pop it in the fridge. This piece would take 12 days to cure. Make a note of the date and turn it throughout its curing period. When day 12 arrives, wash off the cure and all the liquid and pat it dry with a piece of kitchen paper. Pop back in the fridge uncovered for 24 hours for a pellicule (sticky surface layer) to form. This helps to attach the flavour of the smoke. 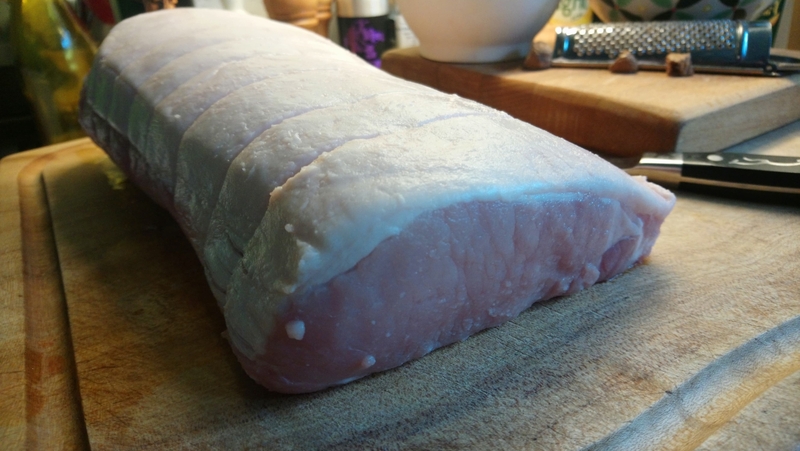 This piece of bacon is now ready for slicing and cooking, vac packing or cold smoking. 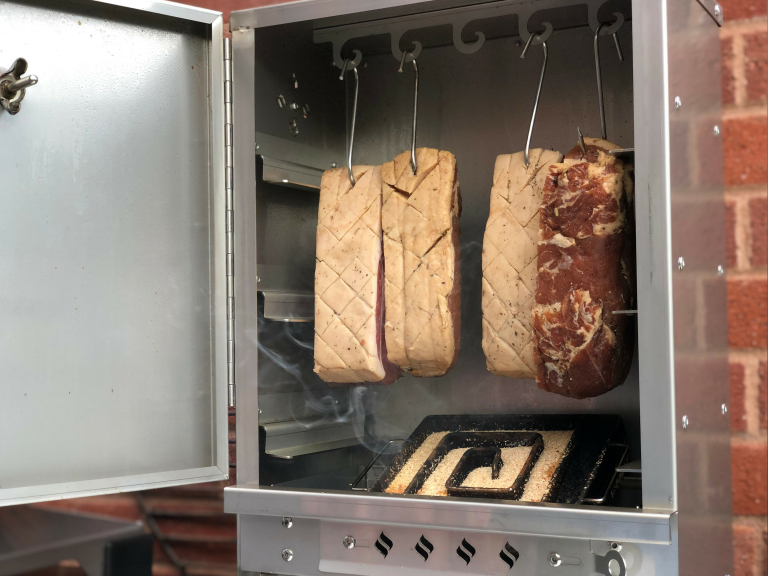 I used the Thuros S1 smoker for this process and some maple wood dust in the Cold Smoking Generator which fits in the bottom. 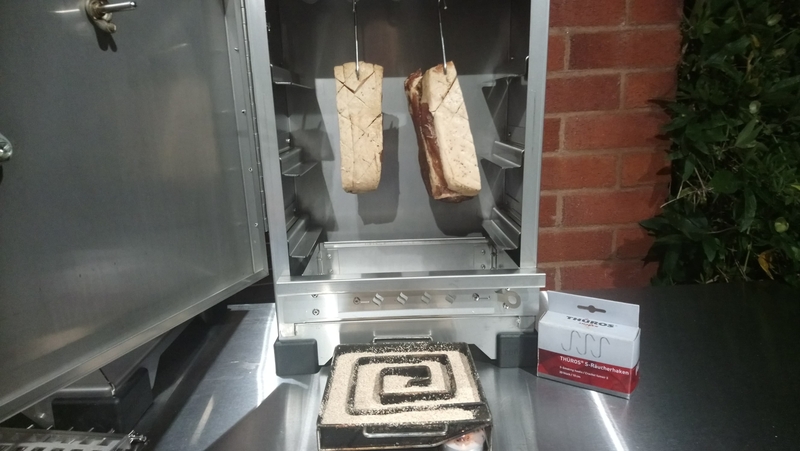 I like my bacon lightly smoked, so I would cold smoke overnight or until the smoke dust has all been used which will be about 12-15 hours using the Pro Q CSG. If you like bacon with a stronger smoke, then repeat this process over several nights or during the day if temperatures are 8C or less, popping it back in the fridge before the next smoke. 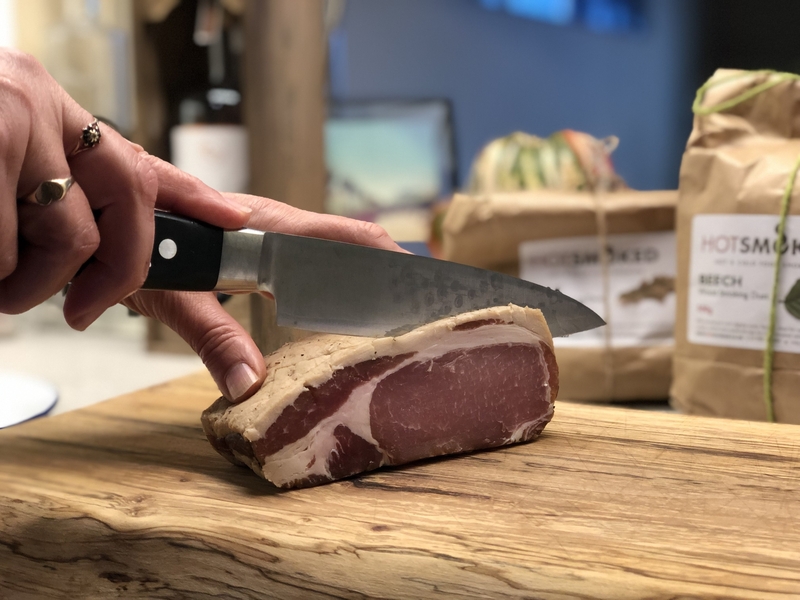 Once you have cold smoked for the desired amount of time, you need to leave it in the fridge for another 24 hours to let the flavours equalize before cutting up and using, or vac packing and freezing. 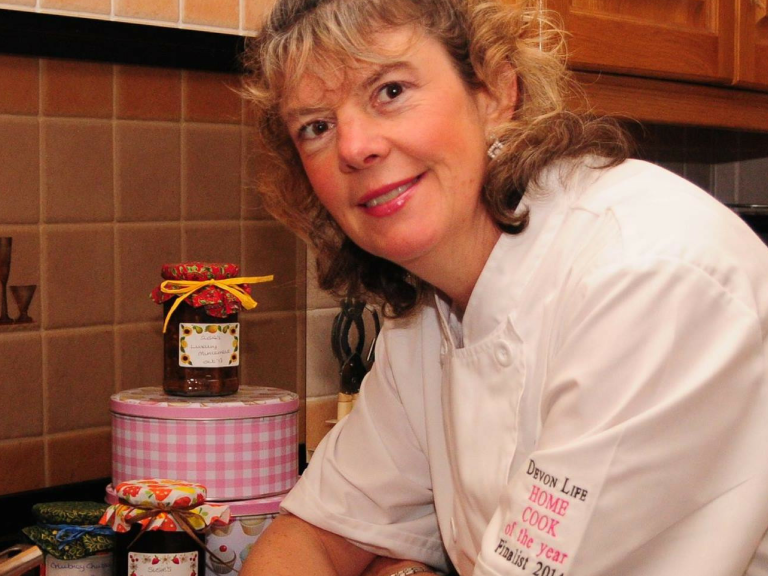 You will rarely buy any shop bought bacon after you have made your own! Fact! I bought Supracure which is a ready to use cure mix for home curing bacon, meat and fish. This is the first time I added fennel seeds to my cure mix. It added a light aniseed flavour to the bacon which was quite pleasant. The first few times I made bacon I used the above recipe but without the fennel and the whole family really enjoyed it. 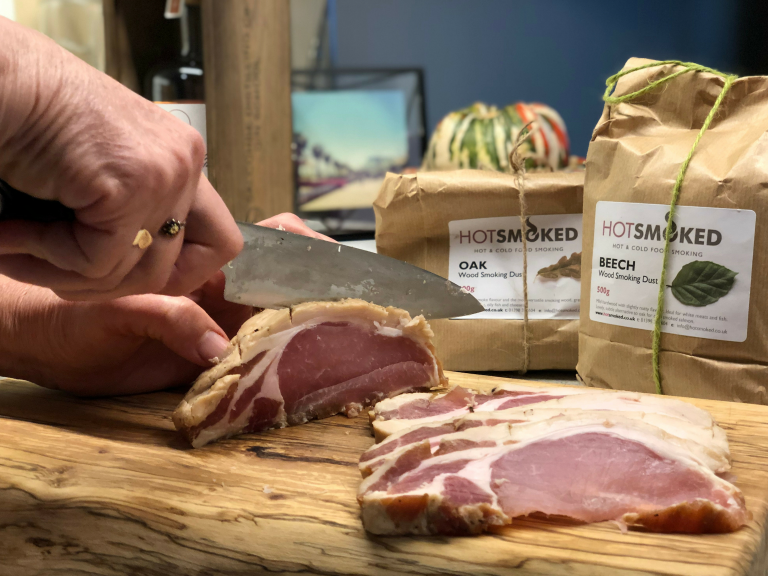 I used Maple dust for this smoke but have successfully cold smoked bacon using Oak. Experiment with different dusts as each give slightly different flavours. www.hotsmoked.co.uk for your Pro Q Cold Smoking Generator, Supracure and flavoured wood smoking dusts.